Happy Friday, Shana Corey! Welcome back to Watch. Connect. Read.! It is always a wonderful day when you visit. Thank you for dropping by to share the book trailer for A Time to Act: John F. Kennedy’s Big Speech and to finish my sentences. Shana Corey: Thank you so much for having me Mr. Schu, this is one of my favorite places to visit! 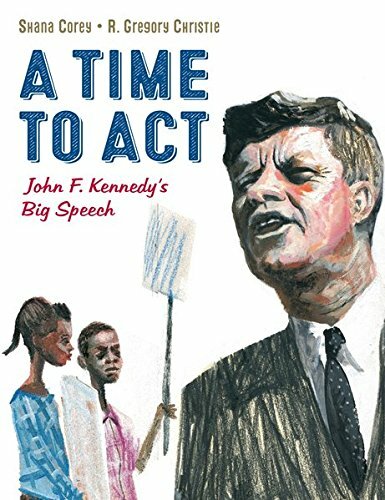 The book trailer for A Time to Act: John F. Kennedy’s Big Speech makes me want to lean closer to listen. Other than a brief intro and closing from Greg’s and my book, the voice is John F. Kennedy, giving his 1963 address on Civil Rights. The speech was long overdue-but it was powerful then and it still is today. It was the first time an American president had told the country in no uncertain times that the system in place was in no way acceptable--not just politically, not just legally. But morally. This book is the story of Kennedy’s evolution on Civil Rights and what led up to that speech. 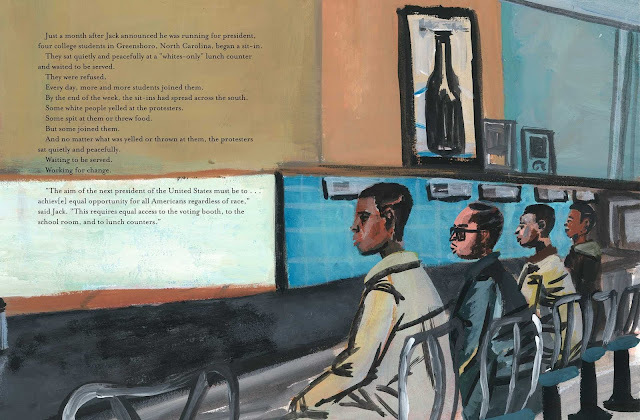 I love hearing Kennedy’s actual speech against the backdrop of Greg Christie’s illustrations. I wrote A Time to Act: John F. Kennedy’s Big Speech because I think it’s important to know our history (even when it’s hard to look at) and understand how we got to where we are, so that we’re better able to move forward. I think it’s important not just for adults but for kids (especially for kids) since they’re going to be creating the future. I wrote this because I have questions-not just about what a president has a responsibility to do, but what we as citizens have the responsibility to do and I think that’s a discussion that’s worth having. And I wrote this because I was inspired by the many kids and teenagers who were on the front lines of the civil rights movement. The civil rights movement was led, not by the President or by elected leaders-but by the people on ground—African American leaders and activists and students and even children, who spoke out and marched and sat in and their bravery and activism was directly responsible for Kennedy’s Civil Rights speech, and ultimately the Civil Rights Act of 1964. I find it empowering to see what people can accomplish when they make their voices heard. 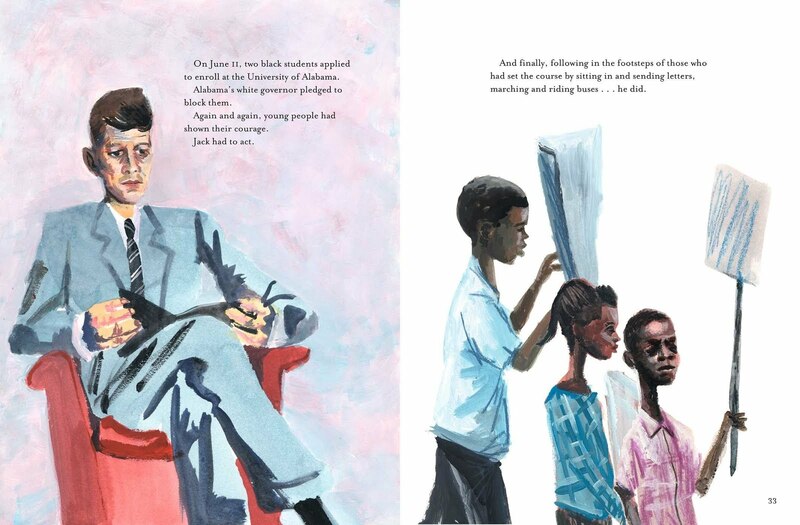 R. Gregory Christie’s illustrations are always stunning, but my favorites here are the ones of children-especially Ruby Bridges and the children watching Kennedy’s Civil Rights speech on their television sets, hearing their president stand up for right. 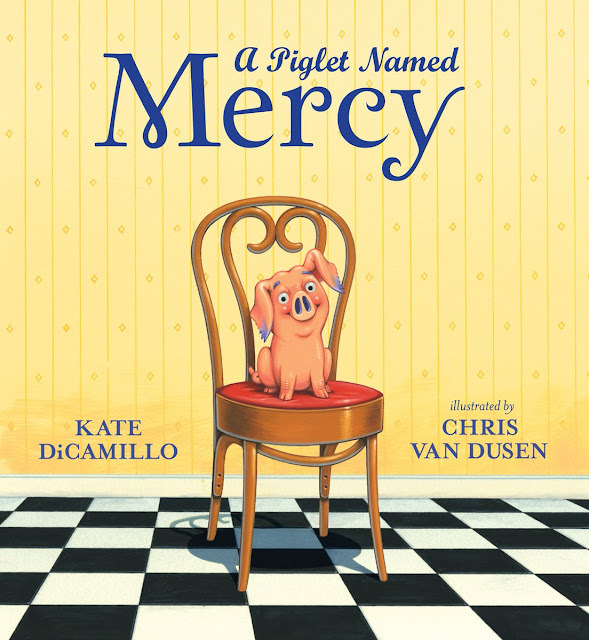 Jackie Robinson, Dr. Martin Luther King, Jr., Coretta Scott King, Eleanor Roosevelt, Ruby Bridges and Marian Anderson all show up in this book. One of the coolest parts of history for me is constantly re-remembering that these icons were (or are) also real people, and while we might know their stories or parts of their stories individually, there is always part of the story we don’t know and for me, with this book, it was a delight to see how often these legends (but also real people) interacted with and sometimes influenced each other. 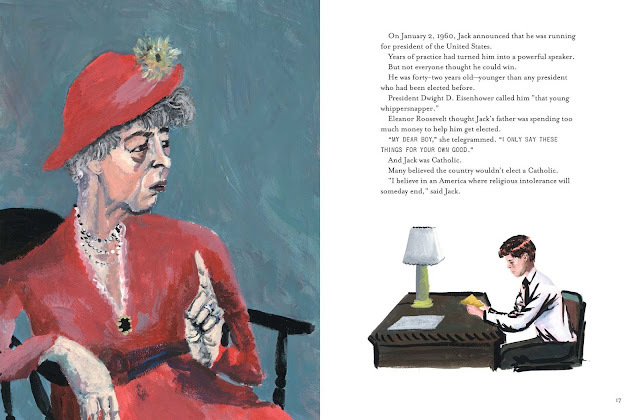 This story highlights some of those interactions-Eleanor Roosevelt writing Kennedy during his campaign and basically reprimanding him for being spoiled, Jackie Robinson writing a letter telling the newly elected Kennedy that he had to act. And finally, Jackie Robinson and Martin Luther King writing after the speech, telling Jack that he had done something that needed to be done. Mr. Schu, you should have asked me what my favorite part of this research was! I’m a sucker for primary sources. It’s so cool to see the interactions I mentioned above actually play out right in front of you! Here are a few of my favorites. So cool to see, right?!?! Look for A Time to Act on April 4, 2017.